"North American football" redirects here. For the association football governing body in North America, see CONCACAF. Diagram of an American football field. Numbers on the field indicate the yards to the nearest end zone. Gridiron football,  also known as North American football  or, in North America, simply football, is a football sport primarily played in the United States and Canada. American football, which uses 11-player teams, is the form played in the United States and the best known form of gridiron football worldwide, while Canadian football, featuring 12-player teams, predominates in Canada. Other derivative varieties include indoor football, football for smaller teams (most commonly eight players), and informal games such as touch and flag football. Football is played at professional, collegiate, semi-professional, and amateur levels. The sport originated in the 19th century out of older games related to modern rugby football and soccer (association football). American and Canadian football developed alongside each other and were originally more distinct before Canadian teams adopted features of the American game. Both varieties are distinguished from other football sports by their use of hard plastic helmets and shoulder pads, the forward pass, the system of downs, a number of unique rules and positions, measurement in customary units of yards (even in Canada, which mostly metricated in the 1970s, yards are still used), and a distinctive brown leather ball in the shape of a prolate spheroid with pointed ends. 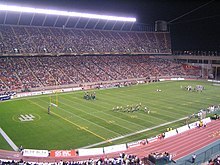 The international governing body for the sport is the International Federation of American Football (IFAF); although the organization plays all of its international competitions under American rules, it uses a definition of the game that is broad enough that it includes Canadian football under its umbrella, and Football Canada (the governing body for Canadian football) is an IFAF member. American football is the most common and widely known of these sports. It was originally more closely related to rugby, until various rule changes created by Walter Camp were implemented in 1880. It is played with eleven players to a side, four downs and a 100-yard field. The major professional league, the National Football League (NFL), has its own rule book. College football programs generally play under the code defined in the NCAA Football Rules and Interpretations. High schools generally follow the rules and interpretations published by the National Federation of High School Associations (NFHS), although some states follow the NCAA code for high school play. Youth games (below high school age) generally follow NFHS code with modifications. Adult semi-pro, alternative and minor professional, amateur, touch, flag, etc. may follow any one of these codes or use their own rules. While the vast majority of the game is the same among these three codes, subtle variations in rules can lead to large difference in play. Many of the differences are in penalty enforcement and the definitions of fouls. Canadian football is played almost exclusively in Canada. Like its American cousin, it was originally more closely related to rugby, until the Burnside rules were adopted in 1903. The game is played on a 110-yard field and has three downs and twelve players to a side. The Canadian game also features a one-point " single" (formally called a "rouge") for a ball kicked into the end zone and not returned by the receiving team. Like the American game, the Canadian Football League and Canadian Interuniversity Sport both have their own rulebooks, although there are generally fewer differences than between their American counterparts. Nine-man football, eight-man football and six-man football are varieties of gridiron football played with fewer players. They are played with four downs (often with a 15-yard requirement for a new set of downs, as opposed to 10 in other codes), fewer offensive linemen, and an 80-yard field. These games are generally based on the high school rulebooks, which have an addendum devoted to the play of these codes, and are generally played by teams from high schools with very small student bodies, usually in rural areas of the United States. Indoor football is played with special rules to accommodate smaller indoor facilities, usually sharing arenas with basketball or ice hockey teams. It is played on a 50-yard field with, usually, eight players to a side. Prototype games were played in 1902 and 1932, both of which used the shortened field but followed the outdoor standard 11 to a side. However, indoor football did not gain popularity until James F. Foster's proprietary version, arena football, debuted in 1986, and set most of the standards for indoor leagues today. As almost all indoor leagues are for-profit professional leagues, each league has its own proprietary code. Sprint football (or lightweight football) is a variant of American football with nearly identical rules but with added restrictions on the maximum weight and percent body fat of players on the field, emphasizing speed and agility over raw size at all positions. It is played at a small number of colleges and universities in the United States. Touch football, flag football, wheelchair football, and backyard football are informal varieties of the game, played primarily at an amateur and recreational level. No specific rulebooks are universally recognized for these variants, where house rules usually apply. Women's American football is the organized play of the sport by women, often with little difference in rules compared to the men's game. Female versions of the informal varieties, such as Powderpuff, also exist. Given the popularity of gridiron football in North America yet the rarity of female-only teams at the high school level and above, female players have also played on men's teams on rare occasion. This is a minimal description of the game in general, with elements common to all or almost all variants of the game. For more specific rules, see each code's individual articles. Prior to the start of a game, a coin toss determines which team will kick off the ball to their opponent. Each team lines up on opposite halves of the field, with a minimum ten yards of space between them for the kickoff. The team receiving the ball can make a fair catch (which stops the play immediately), catch the ball and run it back until the ball carrier is tackled, or, if the ball is kicked out of bounds, let the ball go dead on its own (the last case usually happens when the ball is kicked all the way into or through the opponent's end zone, resulting in a touchback and the ball being brought several yards out of the end zone to begin play). A kicking team can, under special circumstances, attempt to recover its own kick, but the rules of the game make it very difficult to do so reliably, and so this tactic is usually only used as a surprise or desperation maneuver. At this point, play from scrimmage begins. The team in possession of the ball is on offense and the opponent is on defense. The offense is given a set amount of time (up to forty seconds, depending on the governing body), during which the teams can set up a play in a huddle and freely substitute players to set into a formation, in which the offense must remain perfectly still for at least one second (the formation requirement does not apply to Canadian football). At least half of the players (seven in standard American and Canadian football, four in standard indoor ball) on the offense must line up on the line of scrimmage in this formation, including the snapper, who handles the ball before play commences; the rest can (and almost always do) line up behind the line. Neither the offense nor the defense can cross the line of scrimmage before the play commences. Once the formation is set, the snapper snaps the ball to one of the players behind him. (A snapper must snap the ball within 20 to 25 seconds of the official setting the ball back into position after the previous play, and a play clock is kept to enforce the measure.) Once the ball is snapped, the play has commenced, and the offense's goal is to continue advancing the ball toward their opponent's end zone. This can be done either by running with the ball or by a rule unique to football known as the forward pass. In a forward pass, a player from behind the line of scrimmage throws the ball to an eligible receiver (another back or one player on each end of the line), who must catch the ball before it touches the ground. The play stops when a player with the ball touches any part of his body other than hand or foot to the ground, runs out of the boundaries of the field, is obstructed from making further forward progress, or a forward pass hits the ground without being caught (in the last case, the ball returns to the spot it was snapped). To stop play, players on defense are allowed to tackle the ball carrier at any time the ball is in play, provided they do not grab the face mask of the helmet or make helmet-to-helmet contact when doing so. At any time, the player with the ball can attempt a backward, or lateral, pass to any other player in order to keep the ball in play; this is generally rare. Any player on defense can, at any time, attempt to intercept a forward pass in flight, at which point the team gains possession; they can also gain possession by recovering a fumble or stripping the ball away from the ball carrier (a "forced fumble"). A typical play can last between five and twenty seconds. In the event that any illegal action happens during the play, the results of the previous play are erased and a penalty is assessed, forcing the offending team to surrender between five and fifteen yards of field to the opponent. Whether this yardage is measured from the original spot of the ball before the play, the spot of the illegal action, or the end of the play depends on the individual foul. The most common penalties include false start (when an offensive player jumps to begin the play before the ball is snapped, a five-yard penalty), holding (the grabbing of a player other than the ball carrier to obstruct their progress; a ten-yard penalty against offensive players and a five-yard penalty against defensive ones), and pass interference (when either a receiver or the defending player pushes or blocks the other to prevent them from catching the pass). A team on offense cannot score points as the direct result of a penalty; a defensive foul committed in the team's own end zone, if the penalty is assessed from the spot of the foul, places the ball at the one-yard line. In contrast, a defensive team can score points as a direct result of a penalty; if the offense commits a foul under the same scenario, the defensive team receives two points and a free kick. In all other circumstances (except for the open-ended and extremely rare unfair act clause), a penalty cannot exceed more than half the distance to the end zone. In the event that the penalty would be less advantageous than the result of the actual play, the team not committing the penalty can decline it. In order to keep play moving, the offense must make a certain amount of progress (10 yards in most leagues) within a certain number of plays (3 in Canada, 4 in the United States), called downs. If the offense does indeed make this progress, a first down is achieved, and the team gets 3 or 4 more plays to achieve another 10 yards. If not, the offense loses possession to their opponent at the spot where the ball is. More commonly, however, the team on offense will, if they have a minimal chance of gaining a first down and have only one play left to do it (fourth down in the U.S., third down in Canada), attempt a scrimmage kick. There are two types of scrimmage kick: a punt is when the ball is kicked downfield as close to the opponent's end zone as possible without entering it; the kicking team loses possession of the ball after the kick and the receiving team can attempt to advance the ball. The other scrimmage kick is a field goal attempt. This must be attempted by place kick or (more rarely) drop kick, and if the kicked ball passes through the goal set at the edge of the opponent's end zone, the team scores three points. (Four-point field goals are available in a few variations of the game under special rules, but the NFL, college and high school football only offer three-point field goals.) In Canada, any kick that goes into the end zone and is not returned, whether it be a punt or a missed field goal, is awarded one single point. If the team in possession of the ball, at any time, advances (either by carrying or catching) the ball into the opponent's end zone, it is a touchdown, and the team scores six points and a free play known as a try. In a try, a team attempts to score one or two points (rules vary by each league, but under standard rules, a field goal on a try is worth one point while another touchdown is worth two). At the college and professional levels, the defense can also score on a try, but only on the same scale (thus a botched try the defense returns for a touchdown scores only two points and not six). If a team is in its own end zone and commits a foul, is tackled with the ball, or bats, fumbles, kicks or throws the ball backward out of the field of play through the same end zone, the defense scores a safety, worth two points. Play continues until halftime. (Each team switches their side of the field with the other halfway through each half, at the end of a quarter.) After the halftime break, a new kickoff occurs. Whichever team has more points at the end of the game is declared the winner; in the event of a tie, each league has its own rules for overtime to break the tie. Because of the nature of the game, pure sudden-death overtimes have been abolished at all levels of the game as of 2012. ^ a b "Gridiron football". Encyclopædia Britannica. Retrieved October 20, 2010. ^ See, for example: Jack Brimberg and William Hurley (2006). "Strategic considerations in the coaching of North American football". International Journal of Sport Management and Marketing. From International Journal of Sport Management and Marketing, Volume 1, Number 3, pp. 279–287. ^ a b Flaherty, David H.; Manning, Frank E. (1993). The Beaver Bites Back? : American Popular Culture in Canada. McGill–Queen's Press. p. 16. ISBN 978-0-7735-1120-0. ^ Rielly, Edward J. (2009). Football: An Encyclopedia of Popular Culture. University of Nebraska Press. pp. 53–55, 285. ISBN 978-0-8032-2630-2. ^ Flaherty, David H.; Manning, Frank E. (2013). The Soft Tissues: Trauma and Sports Injuries. Butterworth-Heinemann. p. 402. ISBN 978-1-4832-8007-3. ^ Steinberg, Shirley R. (June 17, 2010). Boy Culture: An Encyclopedia. ABC-CLIO. pp. 156–157. ISBN 978-0-313-35081-8. ^ Puhalla, Jim (2010). Sports Fields: Design, Construction, and Maintenance. John Wiley & Sons. p. 339. ISBN 978-0-470-43893-0. ^ Mandelbaum, Michael (2005). The Meaning Of Sports. PublicAffairs. p. 26. ISBN 978-0-7867-3884-7. ^ "Gridiron, n. (3.e.)". Oxford English Dictionary. 1989. Retrieved October 20, 2010. ^ Matt, Kohl (2017). "Pigskin and gridiron: notes on the American Football lexicon". oed.com. Oxford University Press. Retrieved October 5, 2017. ^ Markovits, Andrei S.; Rensmann, Lars (2010). Gaming the World: How Sports Are Reshaping Global Politics and Culture. Princeton University Press. p. 209. ISBN 978-1-4008-3466-2. ^ Encyclopædia Britannica (2009). Britannica Almanac 2009. Encyclopædia Britannica, Inc. p. 868. ISBN 978-1-59339-839-2. Retrieved October 20, 2010. ^ Jewell, Todd (2014). Goddard, John; Sloane, Peter (eds.). "Major league soccer in the USA". Handbook on the Economics of Professional Football: 351–367. ISBN 978-1-78100-317-6. Retrieved October 10, 2017. ^ Leland, Louis S. (1984) https://books.google.com/books?id=FqlEe5d4yJ8C&pg=PA39#v=onepage&q=gridiron&f=false "gridiron"]. A Personal Kiwi-Yankee Dictionary, p. 49. Pelican Publishing Company. ISBN 1-4556-1037-2. ^ Bernstein, Mark F. (2001). Football: The Ivy League Origins of an American Obsession. University of Pennsylvania Press. pp. 9–10. ISBN 978-0-8122-3627-9. ^ "Camp and His Followers: American Football 1876–1889" (PDF). The Journey to Camp: The Origins of American Football to 1889. Professional Football Researchers Association. Archived from the original (PDF) on June 13, 2010. Retrieved 2010-01-26. ^ Gross revenues are unknown, but it is known that the league operated at a net loss of approximately $70 million for the seven weeks that Thomas Dundon owned the league. ^ "CFL pass interference replay hasn't been a problem". Profootballtalk.com. March 28, 2019. Retrieved March 28, 2019. "Gridiron football". Encyclopædia Britannica. Retrieved October 20, 2010. "Gridiron comes to Australia". From 7:30 Report. Retrieved on 2007-10-09 from https://web.archive.org/web/20091214013702/http://www.abc.net.au/7.30/stories/s41614.htm. Encyclopædia Britannica (2009). Britannica Almanac 2009. Encyclopædia Britannica, Inc. p. 978. ISBN 978-1-59339-839-2. Retrieved October 20, 2010. Carlisle, Rodney P. (2009). Encyclopedia of Play in Today's Society, Volume 1. SAGE. ISBN 978-1-4129-6670-2. Funge, Noel (2000). An Australian Dictionary for North Americans. General Store Publishing House. ISBN 978-1-894263-22-1. Retrieved October 20, 2010.